DD received her very first personalized book from My FairyTale Books. 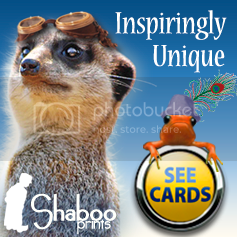 The company specialized in personalized and custom books. When we placed the order, we provide them with DD's name, where we live as well as the names of some of her best friends. Then a book was created using the information we provided. 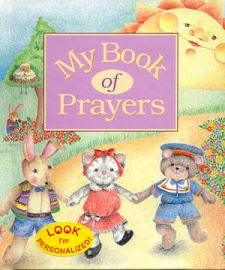 We picked "My Book of Prayers" to review. DD loves her books and she really enjoys having us read to her every day. However, having your name in a book just makes it that much more special, so she asks us to read her book of prayers with more often than other books she owns. 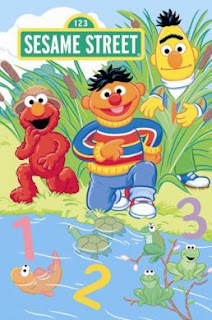 We thought the book we received was well made and it was a great addition to DD's small library of books. You can pick up the book we received to review as well as other fun books from their online store. Many thanks to My Fairy Tale Books. The company has generously offered 1 personalized book as a giveaway prize to one of my lucky readers (US residents only please). 1). Please go to My FairyTale Books and then come back to tell me which book you would like to win (you MUST be a public follower of my blog to enter this giveaway, and your profile can not be set at private). 2.) Blog about my giveaway- with a link back to here, when you leave the comment make sure you include the URL of where your post of my giveaway is. Please do not copy and paste my review over to your blog, please write about why you would like to win this giveaway and provide a link back to this post. The Contest ends May 21st, 2011 at 11:59pm PST. Blogging about my giveaway earns 2 additional entries. 7.) Tweet about this review and giveaway. 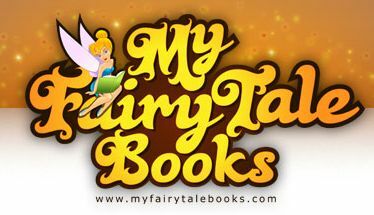 Please tweet the following: " I want to win My Fairy Tale Books @ http://www.sugarpopribbons.blogspot.com/ ". After your tweet, please leave me the url of your tweet so I can check. If you do not know how to check your tweet url, please read this post for step by step instructions. You can retweet once a day for 1 entry each time. I'd love the book Personalized Children's My Fishing Adventure Book and I'm a public follower. I entered your Melissa & Doug $130 Wooden Railway Giveaway. I entered your Virescent Shopper Bag Giveaway. I entered your Snickers Peanut Butter Squared Giveaway. I entered your Organic Baby Gift Boutique Giveaway. I entered your Lovable Labels Camp Pack Giveaway. I entered your Saky Sacks Giveaway. I entered your PopCorners Giveaway. I entered your Navitas Naturals Giveaway. 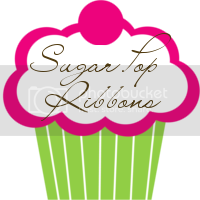 I entered your Carolyn's Kitchen Retro Apron Giveaway. 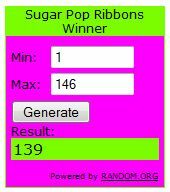 I entered your Sweetsation Therapy Giveaway. I entered your Western Chief Children's Rain Boots Giveaway. I entered your Johnsonville Sausage Giveaway. 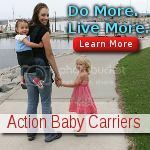 I entered your Combi Cosmo Stroller Giveaway. I entered your Scaremenot Monster Giveaway. I entered your Hank Player Boy's Clothes Giveaway. 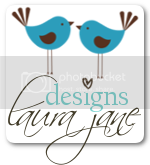 I entered your Executive Gift Shoppe Giveaway. I entered your Lily Organics Skin Care Giveaway. I entered your Luna Organics Giveaway. I entered your Udderly Smooth Products Giveaway. I entered your JAWS Cleaning Products Giveaway. I entered your Namaste Inc. Handbag Giveaway. I entered your Britax Roundabout 55 Car Seat Giveaway. I entered your Backyard Safari Outfitter Giveaway. I entered your Bodycology 6 Piece Body Mist Gift Set Giveaway. Would like to win My Baby Book. Due in July! Thanks for the giveaway! I am a facebook friend of yours #1. I am a facebook friend of yours #2. The personalized ballerina book would be a hit! Tweet about this review and giveaway. I follow on GFC and I'd like the My Camping Adventure book. I would like to have the "My Christmas Wish Book"
I like the My Birthday Surprise book. kristiedonelson(at)gmail(dot)com Thank you. I would like the Ballerina Princess book. I would pick the ballerina book for my little Valentina!! !